In 2014 Lok Sabha election, India witnessed a bombardment of social media penetration, where political parties made efforts to connect to the voters using the digital platform, which was easy and effective to target both urban and rural masses. The trend continued in successive elections as politicians realized that social media was an ultimate platform to connect to the masses. This time, Meghalaya election has also become very interesting with almost all major political parties running their campaigns on social media – be it Twitter, Facebook, Youtube or Instagram. Meghalaya Chief Minister Mukul Sangma, who is on a whirlwind tour addressing several election rallies is keeping the audience updated with video and picture contents on social media. Through Facebook and Twitter, Mukul is not just connecting to the masses but is also sending a strong message to his opponents. “I offer my opponents a bargain: If they will stop telling lies about us, we will stop telling the truth about them,” he said in a post on Friday. The war of words during election witnessed in traditional media is also seen on the digital platform, where political parties and high-profile candidates have sponsored their pages to get their message conveyed. All political parties are using the latest technology like drone, osmo and high-end cameras to create powerful audio-video and graphical content. 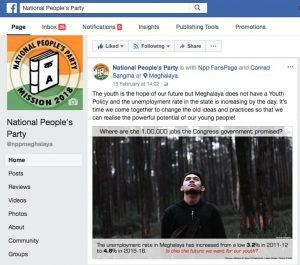 In fact there are pages like – ‘I support Mukul Sangma’, ‘Not my NPP’ or ‘We need change in Meghalaya’, ‘We care for Meghalaya’ are some of the pages, where social media warriors of different political parties are trying to score over each other. 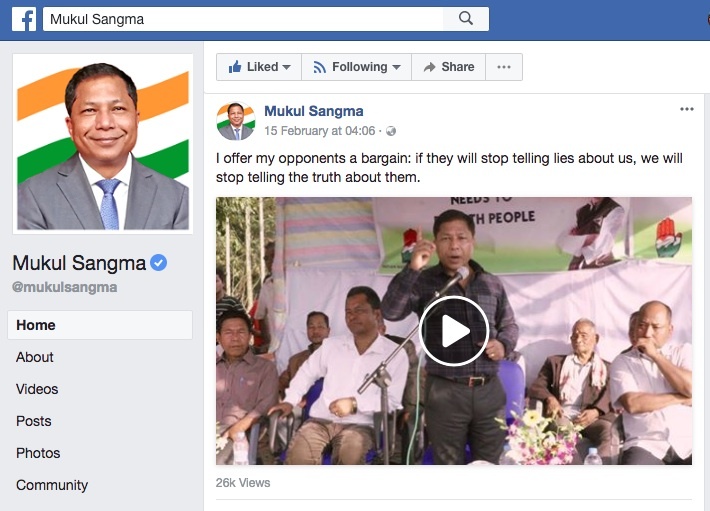 The National People’s Party (NPP) of Conrad K Sangma, in its latest 5-minute video titled – ‘Wave of NPP’ released in Youtube and Facebook tries to woo voters by explaining to the audience that the dictatorial attitude and one man show of Chief Minister Mukul Sangma has to end. NPP has cornered the ruling Congress in its post by highlighting facts on increase in crime against women, lack of employment and is pledging its promise to the electorates that if NPP is voted to power there will be a reverse trend. “Crimes against women have increased in Meghalaya and tragically the conviction rate is very low. We must all come together to change mind-sets and overhaul the system to put an end to this!” a post in NPP official page read, which had figures and graphic content. Through its official page, NPP is attacking the government on different sectors like health, education and employment, where are being equally responded by the Congress party. In the digital war – NPP and Congress are seen to be as the main rivals, while BJP is making effort to highlight the growth and development under Prime Minister Narendra Modi. BJP is also attacking the Congress for its failure to implement different central schemes. 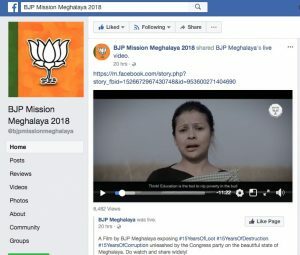 In the latest post through its official platform, BJP Mission Meghalaya, the party highlights through a film titled – ‘15 years of loot, 15 years of corruption, 15 years of destruction’ and shames Congress for its failure in the implementation of central schemes and failure to fulfil the aspirations of the people.